Much has been written about a lost civilization that existed thousands of years ago on a landmass in the middle of the Atlantic Ocean. Yet are we any closer to knowing if there really was an island continent located in the North Atlantic that gave birth to one of the world's greatest civilizations? Most scientists scoff at the very idea. But science is an on-going, ever-changing, dynamic study of the world around us. New facts emerge, theories are adjusted and we inch slowly toward the ultimate truth. True science adjusts its theories when new facts emerge and avoids falling into the trappings of dogma. While psychics like Edgar Cayce have given us much information about Atlantis, this material would not be deemed scientific unless it could be verified. People want proof. So let us take a look at what the Cayce readings actually say about Atlantis and if they can be verified scientifically. 1. EC: Yes, we have the subject and those conditions. As has been said, much data has been received from time to time through psychic forces as respecting conditions in or through the period, or ages, of this continent's existence. That the continent existed is being proven as a fact. 2. Then, what took place during the period, or periods, when it was being broken up? What became of the inhabitants? What was the character of their civilization? Are there any evidences of these, or any portion of, the inhabitants' escape? The POSITION of the continent, and the like, MUST be of interest to peoples in the present day, if either by inference that individuals are being born into the earth plane to develop in the present, or are people being guided in their spiritual interpretation of individuals' lives or developments BY the spirits of those who inhabited such a continent. In either case, if these be true, they ARE WIELDING - and are to wield - an influence upon the happenings of the present day world. 3. The position as the continent Atlantis occupied, is that as between the Gulf of Mexico on the one hand - and the Mediterranean upon the other. Evidences of this lost civilization are to be found in the Pyrenees and Morocco on the one hand, British Honduras, Yucatan and America upon the other. There are some protruding portions within this that must have at one time or another been a portion of this great continent. The British West Indies or the Bahamas, and a portion of same that may be seen in the present - if the geological survey would be made in some of these - especially, or notably, in Bimini and in the Gulf Stream through this vicinity, these may be even yet determined. 4. What, then, are the character of the peoples? To give any proper conception, may we follow the line of a group, or an individual line, through this continent's existence - and gain from same something of their character, their physiognomy, and their spiritual and physical development. 5. In the period, then - some hundred, some ninety-eight thousand years before the entry of Ram into India - there lived in this land of Atlantis one Amilius [? ], who had first NOTED that of the separations of the beings as inhabited that portion of the earth's sphere or plane of those peoples into male and female as separate entities, or individuals. As to their forms in the physical sense, these were much RATHER of the nature of THOUGHT FORMS, or able to push out OF THEMSELVES in that direction in which its development took shape in thought - much in the way and manner as the amoeba would in the waters of a stagnant bay, or lake, in the present. As these took form, by the gratifying of their own desire for that as builded or added to the material conditions1, they became hardened or set - much in the form of the existent human body of the day, with that of color as partook of its surroundings much in the manner as the chameleon in the present. Hence coming into that form as the red, or the mixture peoples - or colors; known then later by the associations as the RED race. Much information can be gleaned from this single reading. It gives rough boundaries for Atlantis and gives us some clues where we still may find evidence of that civilization. It would seem logical that the American Indian, as the prime representative of the “RED” race, and the various people populating the Yucatan area and British Honduras (Belize) would show remnants of the Atlantean civilization. Of course Bimini, is specifically mentioned as an important site. The Pyrenees Mountains and Morocco are mentioned as areas that would show evidence of what would be the eastern coast of Atlantis. From this it would seem obvious that the central area of this landmass would lie over what is now called the Mid-Atlantic Ridge (MAR). Therefore, there should be some scientific evidence of Atlantis in the general area of the MAR. Fig. 1. The North Atlantic showing the Mid-Atlantic Ridge and some areas where we might find evidence of Atlantis. 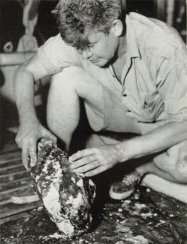 Dr. Ewing examines a 60-million year old rock retrieved from the foot of a cliff on the flank of the Mid-Atlantic ridge. Copyright National Geographic. This would seem to preclude using the continental drift theory as a reason for Atlantis not existing. 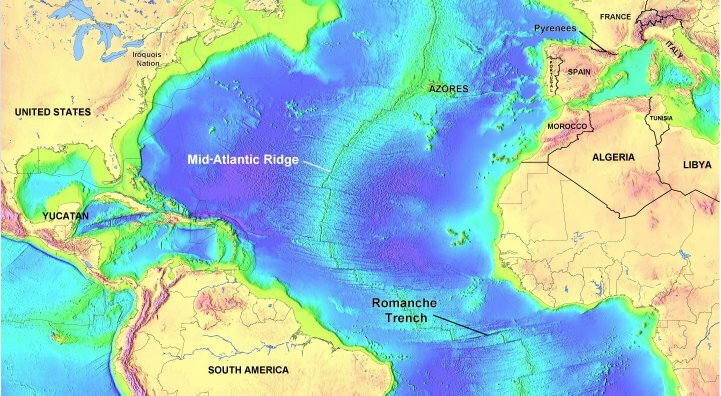 In other words, there was room for Atlantis in the Atlantic Ocean as far back as 60 million years ago. Another surprising discovery was a great plain that took them over two and a half days to cross. The bottom of the deep ocean was thought by most geologists (at that time) to be covered with a great and uniform thickness of sediment--thousands of feet thick--which has accumulated upon it like a steady un-drifted snowfall since its formation and which remained forever undisturbed. However, from a point about 385 nautical miles northeast of Bermuda to a point about 945 miles west of the Azores the sediment was less than 100 feet thick. This would seem to indicate that accumulation of sediment had not been occurring in this area for very long. Why? Dr Ewing also found what appeared to be "beach-like terraces two miles deep".5 His hypothesis was that the long, level terraces, with sediments ranging up to 3000 feet thick, were submerged shore lines. Ewing tried to label this as "extremely radical speculation to identify these level stretches more than two miles below the sea surface as former beaches6.” But obviously, that's what they looked like otherwise why bother to hypothesize about them? Just because, as Ewing noted, "such a theory would require the obvious but almost incredible conclusion that the land here has subsided two miles..."7 does not mean that such subsidence could not have occurred however. In other words, a part of the Atlantic Ocean, 1,200 miles from land, had to be a beach at one time. So it seems that as far back as the first scientific expedition over the MAR there was already some evidence that some areas of the MAR may have sunk in pre-historic times. Of course this was extremely controversial in light of the currently accepted theories of North Amerindian origins involving land bridges over the Bering Strait. Since almost all of the tribes exhibiting haplogroup X are centered around the northern Great Lakes area and east of there, and no Asian group had been found with haplogroup X, it makes sense to conclude there was a land bridge (Atlantis) between northeastern America and Europe. Of course this conclusion was not a viable option so they concluded that they didn't sample enough Asian populations. *Putative and obtained from literature report---only partial CR sequence was available. These samples have the 16223T and 16278TCR mutations and do not belong to Native American mtDNA haplogroups A--D; thus it is probable that they are members of haplogroup X. Table 115 shows that 1,039 Asian people were genetically tested and none showed haplogroup X. In a follow-up study16 they tested an additional 790 Asians and they finally found seven people who could be classified as belonging to haplogroup X. Apparently, this “candidate source” from tiny Altai, traveled across Siberia, over the Bering Strait, through Alaska, Canada and northwest America, crossed the Rocky Mountains and all the Great Plains and settled in the Great Lakes area without mixing with any other populations along the way because no one from Altai east to the Great Lakes shows haplogroup X. Yet this migration is supposed to have taken place and is a viable conclusion from the data! HLA in the Azores Archipelago: possible presence of Mongoloid genes. Longas J, Varela P, Castro MJ, Arnaiz-Villena A. Hospital de Santo Espirito de Angra do Heroismo, Azores. The HLA profile of the Azoreans has been compared with those of other world populations in order to provide additional information regarding the history of their origins. The allele frequencies, genetic distances between populations, correspondence analyses and most frequent haplotypes were calculated. Our results indicate that the Azorean population most likely contains an admixture of high-frequency Caucasoid, Mongoloid and, to a lesser degree, Negroid HLA genes. The middle Atlantic Azores Archipelago was officially colonized by the Portuguese after 1439 and historical records are concordant with the existence of Caucasoid and Negroid population. However, Mongoloid genes were not suspected, but the Oriental HLA haplotypes A24-B44-DR6-DQ1, A29-B21-DR7-DQ2 and A2-B50-DR7-DQ2 are the fourth, fifth and sixth most frequent ones in Azores. A correspondence analysis shows that the Azorean population is equidistant from Asian and European populations and genetic distances are in some cases closer to the Asian than to European ethnic groups, and never are significantly different; also, B*2707 subtype is found in Asians and Azoreans (but not in Europeans) and the same Machado-Joseph Disease founder haplotypes (Chr 14) are found in both Japanese and Azoreans. It is proposed that a Mongoloid population exists in Azores; whether, the arrival occurred prior to discovery is undetermined. Maybe the Azores (which many consider as merely the mountain peaks of Atlantis) would be a more logical "candidate source" for the genetic makeup of the American Indian. Could it be that the major genetic source for the American Indian didn't travel from the west across the Bering Strait via Berengia, but came from the east and landed on the Atlantic seaboard when their homeland disappeared beneath the waves? Unfortunately, genetic theories that include the possibility of a former continent in the Atlantic Ocean are generally not considered viable by mainstream science. In another reading we find specific mention of the Iroquois as direct descendants of Atlanteans. The entity then was among the people, the Indians, of the Iroquois; those of noble birth, those that were of the pure descendants of the Atlanteans, those that held to the ritualistic influences from nature itself. That along the Atlantic board formed the outer portion then, or the lowlands of Atlantis. I am not sure what haplogroup the Iroquois tribe belongs in as I cannot find a specific study that deals with this issue. What would be interesting to see is a study that would compare the genetic data of either the Ojibwa (Chippewa) (known haplogroup X carriers) or one of the Iroquois tribes and two other populations that may have had Atlantean “roots”: the Berbers of North Africa and the Basque from the Pyrenees. If a genetic relationship can be found between these two groups from opposite sides of the Atlantic Ocean then science may be forced into making conclusions about the existence of Atlantis. From the Atlas Mountains--the northwest border of the Sahara desert--to the Atlantic and Mediterranean coasts and the Strait of Gibraltar--gateway to Europe--Morocco is a unique and historically crucial African territory. Berbers lived there over 3000 years ago. A current theory on the origin of the Berber population is that they were descended from Hamites who came from the Red Sea coast. These Hamite-speaking people were subdivided into Berbers, Egyptians and Ethiopians. The Berbers were thought to have continued west through Tunisia, Algeria and Morocco. In Roman times their population was around 3 million spread through-out North Africa. The Arabs conquered Morocco in the 8th century. In a study to determine the genetic profiles of Arab-speaking Moroccans18, it was found that they were still genetically Berbers or Imazhigans and the Basque (who live in the Pyrenees) were also related. Some of their findings are summarized in Table 3 below. Table 3. “Standard Genetic Distances between Moroccans and other populations”. Standard genetic distances (SGD) between Moroccans and other populations (x 102) obtained by using HLA-DRB1 allelefrequencies (Negative values may be assumed as 0 values; otherwise, the highest negative value may be regarded as the closest one). Standard error is 0 in all cases. One of the problems of Mediterranean ethnography has been the lack of genetic marker data coming from southern Mediterranean populations. This has led to a lack of comparative genetic studies between northern and southern Mediterraneans. The powerful genetic polymorphisms of the Human Leukocyte Antigen (HLA) system have been used to identify individuals and populations. The HLA system has been used to identify individuals in order to solve paternity suits and also in forensic problems. DNA-typed HLA class II alleles and the discovery of new loci even increase the HLA strength for distinguishing individuals. This HLA discriminating ability may be used to identify populations because particular alleles only appear or are very frequent in certain populations. Particular combinations of neighboring alleles (HLA haplotypes) are in characteristic frequency in certain living populations. TABLE 4. The nine most frequent estimated extended haplotypes in Algerians and tentative assignment to the original contributing ethnic groups. Only common to French-Basques (HF: 2.7) and Spanish-Basques (HF: 1.2) [3, 18]. It is probably a haplotype of a paleo-North African-Iberian origin; it is different from the worldwide distributed A 1-B57-DR7 haplotype which goes with Cw6 and DQ9. In a study done in 1981 in the Algerian/Kabyle population, this haplotype was also found to be the second most frequent [391. It was described as A1-Bw17. b Also found in Spaniards (HF: 3.1), Sardinians (HF: 11.4), and French-Basques (HF: 4.7) [181. Its frequency is much lower or absent in other Caucasoid populations. This haplotype was defined as Iberian-paleo-North African [ 191. Presently, reported data on Algerians support this hypothesis. Bouali et al. found this haplotype to be the first most frequent in Algerians; it was described as 1318-BtFl. c Shows the highest frequency in Armenians (HF: 3. 1) and is also high in frequency or present in other Mediterranean Caucasoid populations and as Sardinians (HE: 2.7), Spaniards (HF: 2.6), French (HF: 1 4), Greeks (HF: 1. l), and Italians (HF: 0.7) [181. Bouali et al. found it in Algerians. This haplotype does not appear in Basques and has a much lower frequency in northern European Caucasoid populations . The fact that Armenians (and not Basques) bear this marker does not support a theory that Basques and Armenians are related and with common descent [31. Armenians may have acquired this haplotype during their historical Middle East Mediterranean settlements in the middle ages [451. Alternatively, this haplotype may be of Armenian origin. Also found in Italians (HE: 2.3) and Greeks (HF: 2.0) [181. B35-DR11-DQ7 is also present in non-Iberian Mediterranean areas such as Albania (HF: 3.3), Armenia (HF: 5.0), and France (HF: 1.1) and in other populations such as Germans (HF: 3.4), Indians (HF: 3. 1), and Hungarians (HE: 3.9) [181.
e Common to Sardinians (HF: 2.7) and French (HF: 1.0) [ 18]. HLA-B35-DR3-DQ2 is also present in Greeks (HF: 1.9) and Uralic populations (HE: 3.1) [181. It could be a non-Iberian Mediterranean haplotype. f Only present in Algerians. g Appears in Spaniards (HF: 1.4) [31 and has been defined as a northern European haplotype 1291 due to its high frequency in Danes (HF: 3.6), Austrians (HF: 3.2), Czecks (HF: 2.5), Germans (HF 2.5), Yugoslavians (HF: 2.4), and also in French (HF: 1.8) and Italians (HF: 0.6) . h Common to French-Basques (HF: 3.6), Cornish (HF: 3.6), Austrians (HF: 2.6), Britons (HF: 2.3), and Spaniards (HF: 1.9) 0,181 and does not appear in high frequency in northern Caucasoids, such as Scandinavian, or in other Mediterraneans. This haplotype is extended throughout England, Spain, and northern Africa. Fig 2. Dendrogram showing close relatedness of Algerians to Spaniards and Basques. Our results fully confirm that Basques and Spaniards cluster together with an African population, Algerians. This also supports the theory that Iberians and paleo-North African Hamites (mainly represented by Berbers at present) are genetically related populations with common ancestors and that Basques may be a relative isolate of these primitive Iberian populations. The genetic system used (HLA) is one of the most powerful and polymorphic genetic systems which may be utilized to discriminate populations. In addition, results obtained analyzing haplotype frequencies, particularly of the characteristic haplotype A-30-B18 and A1-B57-Cw7, which are probably markers of neolithic Iberian people (Table 4), further support a relatedness between paleo-North Africans (Berbers) and present-day Spaniards and Basques (Iberians). In summary, in the present work, complete HLA data on Basques and Spaniards was compared for the first time with similar HLA data on a North African population (Algerian) with a high paleo-North African (Berber) component. Figure 2 (dendrogram) shows that Basques and Spaniards are closer to Algerians than to any other Caucasoid, Negroid or Mongoloid population….These data are the strongest reported genetic support for a common descent of Basques, Spaniards and Algerians [Berbers]…21. Although reading 364-3 specifies Morocco as an area for Atlantean evidence and not Algeria, it may have been meant in more of an archeological context. Certainly the Berbers as an ethnic group were not bound by arbitrary divisions of the land they lived on into countries. Also it may be that Morocco was the original place in North Africa where Atlanteans first migrated and they subsequently fanned out in an easterly direction. This is in direct contradiction to what is currently accepted (see above). On the other hand, it may be remembered that many of the “life readings” channeled by Cayce mention people traveling from Atlantis to first the Pyrenees and then to Egypt. Perhaps some of the “former” Atlanteans who ended up in Egypt migrated west towards Tunisia, Algeria and Morocco and “became” the Berbers. 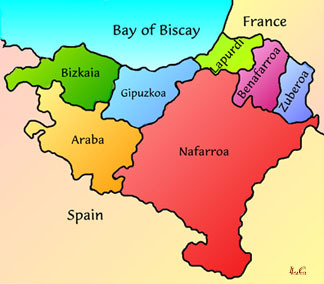 At any rate, a common ancestor of both the Basque population and the Berbers is now a fact. While this does not prove Atlantis in any way, the available genetic evidence could support either the current theory on the Berbers or the statements made in reading 364-3. Scholars the world over have repeatedly declared that ancient sources describing Atlantis are plentiful, "but before Plato - nothing". They make such a declaration because of several reasons. (1) They disregard every record in which Atlantis is not mentioned by name. (2) Atlantis must be spelled the same way Plato spells it. (3) They are unfamiliar with the Sanskrit writings of India. These criteria are totally invalid. Egyptian tradition begins with the "reign of the gods"
In all there were ten of these so-called "god-kings"
From all appearances they were called "Atlanteans"
This last statement will be challenged by scholars, so let's take a closer look at the Egyptian king-lists. One noticeable fact is that Manetho (250 B.C.) calls the first series of kings who ruled during the "reign of the gods," Auriteans. This seems to be nothing more than a corruption of the word "Atlantean". Let me explain. Egyptian hieroglyphics only approximate real sounds: for instance, a hieroglyphic "k" must be used to represent the hard "g" sound. The hieroglyph that Manetho transcribed as r can equally be transcribed as an l. Thus the "Auriteans" of Manetho's king-lists could just as well be "Auliteans": phonetically almost identical to "Atlanteans". This idea obtains credible support from the fact that the ancient Phoenician historian Sanchuniathon (1193 B.C.) calls these very same kings "Aleteans" (Cory, 1826). Isn't it likely that Aleteans=Atlanteans? Present day scholars are so steeped in Greek and Roman (western) culture that Indian sources are too often ignored. The Vishnu Purana (2000 B.C. ), the oldest of the Hindu Puranas, speaks of Atala, the "White Island," which is one of the seven dwipas (islands) belonging to Patala (Book II, chaps. i, ii, and iii). The Purana locates Atala geographically on the seventh (heat, or climate) zone, which according to Col. Wilford (the translator) is 24 to 28 degrees north latitude: which puts it in the same latitude as the Canary Islands just off the North African coast. The Mahabharata contains more than one account of a powerful island empire in the Atlantic which sank to the bottom of the "Western Ocean" following a horrendous war. As in the Vishnu Purana, it is called "the White Island, Atala" (which can be linked linguistically with the word "Atlantis"). Atala is described as an "island of great splendor," and its inhabitants are said to worship only one God (Santi Parva, Section CCCXXXVII). “Another description is remarkably similar to Plato's, even down to its circular capital city, Tripura! Tripura is made in three parts, just as Plato's Metropolis is divided into three parts by circular canals. The famed "Triple-city", with all its inhabitants, is sent burning to the bottom of the ocean in a most unique manner (Mahabharata). Atala is said to be inhabited by "white men who never have to sleep or eat". (Santi Parva, Section CCCXXXVII) The Greek historian Herodotus (450 B.C.) describes a tribe of Atlanteans who "never dream and eat no living thing". (History, Book IV) Can this be coincidence? And just as the god Poseidon is very much involved in the Atlantis story, likewise in the Sanskrit accounts we find Varuna (the Hindu Poseidon) very much involved in Atala. Dr. Leonard covers many other areas at his website and many other cultures. His knowledge of ancient writings I find important because it predates Plato's writings on Atlantis. They call themselves Euskaldunak, their country Euskal-Herria their language Euskara. Their little homeland, once much larger in size, straddles the crest of the western Pyrenees between France and Spain. It is land of deep oak forests, green mountain valleys and the rugged seacoasts of the Bay of Biscay. In size it is barely a hundred miles across and in numbers they claim some three million inhabitants. The Basques are easy to define geographically, but impossible to account for historically. Where they came from nobody knows. Evidently they wandered into the Pyrenees millennia ago. It was in matters of language and blood type that scientists came to the conclusion that the Basques were a distinct people totally unrelated to the Indo-Europeans who dominated the rest of Europe. While the British Isles are not specifically mentioned in reading 364-3 it would not take too much of a stretch in the imagination to see that Morocco, the Pyrenees and the Wales/Ireland area to be lands that were very near to what once could have been considered the east coast of Atlantis. 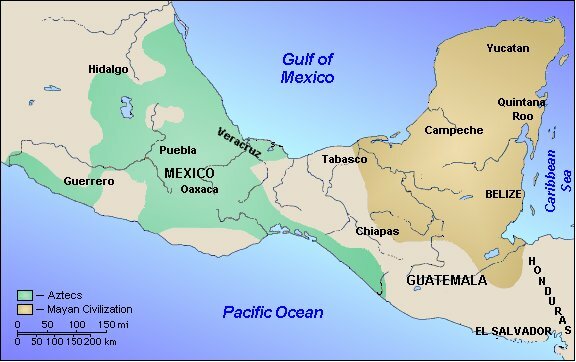 From the map below, one can see from the brown shaded area that the Mayan civilization was in the same general area where Reading 364-3 stated there should be some evidence of Atlantis. The entity was among those of the second generation of Atlanteans who struggled northward from Yucatan, settling in what is now a portion of Kentucky, Indiana, Ohio; being among those of the earlier period known as Mound Builders. It is interesting to note that the Navajo Indians are the only other tribe west of the Great Lakes (except for the Sioux in the Dakota area) to have a few members (6.5%) in haplogroup X and are located in New Mexico (see Table 1). While archeological sites literally cover the Yucatan peninsula, Mayan ruins are obviously not linked to Atlantis because there is no Atlantis to link it to. Although ancient pyramid builders were on both sides of the Atlantic Ocean it is perceived by mainstream archeologists as a “coincidence”. About the only statement that can be made about the Yucatan area is that it is obvious that some ancient people built an advanced civilization there that lasted for thousands of years. Again, no one knows where they came from. EC: Yes, we have the land known as Bimini, in the Atlantic Ocean. In the formation of the land, we find this of the nature that would make the oil production very low, for this is of the coral structure in the greater part, but this is the highest portion left above the waves of once a great continent, upon which the civilization as now exists in the world's history found much of that as would be used as means for attaining that civilization. It is somewhat surprising that there seems to be very little evidence of Atlantis on Bimini. The “Bimini Wall” seems to be composed of beach rock.29 No temple of the Poseidians has been located nearby as one reading suggests. Of course that doesn't mean it wasn't part of Atlantis, just nothing has been found to prove it. If we read 364-3 closely however, it does not actually state that evidence of Atlantis will be found here but that the British West Indies or the Bahamas and Bimini were “some protruding portions within this that must have at one time or another been a portion of this great continent.”It may have been a statement made to further clarify where Atlantis was once located as opposed to where evidence of its existence might still be located. As we search the Caribbean area, the only place that has made any “waves” is Zelitsky's discovery of apparent megalithic structures off the coast of Cuba. (see THC article). Until these are fully explored (Cuban permit and financial concerns are holding things up) we cannot say much about them, but it is reported that one of the rock samples brought up from the structures was polished granite which is not indigenous to the area. If this is true, then something important may have been discovered and hopefully a full scientific exploration of the area could be organized. When checking the Cayce readings on Atlantis, a surprisingly high correlation is found between the readings and the scientific inferences and/or observations produced in this article. Since much of the evidence can be interpreted in various ways, the readings' story of Atlantis cannot be scientifically dismissed out of hand. In fact, I believe I have shown that the readings are to a large extent validated by scientific observations. There is much about our history that is based on conjecture and hypothesis. The further back that we travel into antiquity, the less certain science seems to be. Indeed, the various psychic sources channeled by Edgar Cayce may yet turn out to be better guides to our pre-history than science itself, for many years to come. Amplification of this sentence seems to be found in the following short note found in "Are The Readings' “Monstrosities” Of Atlantean Days Represented By The Prehistoric “Composite” Beings Of Ancient Bone Carvings And Rock Art?"